My goal in my conference was to create a space of otherness, where ones mind can be captivated by the illusion of communal thought and belief. This power, created and allowed by mans need to withdraw from his own agency, has been used by institutions of power since the beginning of time. Organized religion, public education, the institution of capitalism, etc. are all examples of man’s constructed centers of power with aesthetic and philosophical ideals and restrictions which give them the longevity and value to society. For my project, I wanted to play with the ideas of power, consumerism, illusion, surrealism, visual and textual storytelling, and belief. I did so by establishing an imagined institution, one which had set values, rules, and aesthetic goals. 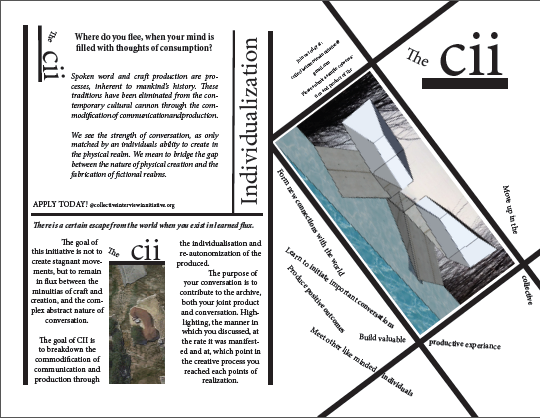 For my project, I created a pamphlet for the CII, “Creative Interview Initiative”, a group which focuses on the documentation of conversations and physical creation. The purpose was to impose values and systems for people to reevaluate their artistic practice through a communal lens. By formatting the text into fragmented and disjointed parts I was able to create a cohesive and multifaceted pamphlet to discuss my ideas, through the fabricated voice of this group. I handed out my pamphlets in the Heimbold Visual ArtsCenter and received some interesting feedback. People didn’t question the content or even want to know more. I, in fact could hardly get anyones notice of my project. I think if I were to extend the project in the future, I would set up a booth with a banner in Heimbold’s atrium and hold an information session. This would add a more official appearance to my project.